Today I’m going to chat about two kinds of products I didn’t even know existed! Gosh, by the end of this Kitchen Event, I might be more for a chef! 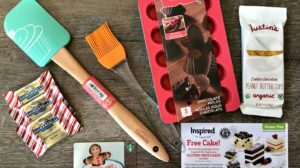 Or a mom who is making her life easier with cool products. My own mother is probably going to laugh at me when she reads that I never heard of a pressure cooker. If you are like me and don’t know what it is, I’m going to define it in a few words. A fast slow-cooker. Really! Facts: is designed to cook healthy meals in less time than it takes to use a microwave. The strong-lock lid securely fastens to the cooker’s body, allowing steam pressure to build and food to cook quickly. An overpressure plug on the lid automatically releases steam if it builds up excessively. The ergonomic “Stay Cool” handles are comfortable to the touch. I have to admit that I was a little nervous about using this the first time. It seemed complicated, but once I read through the directions and got to know the pot, it was very simple. I decided to start out easy and cook some chicken I was going to shred up for that night’s meal. The thing I didn’t quite understand is HOW do you determine when the chicken is done? There is no window to look and the lid is locked. You can’t just open it since the pressure is built up. The instructions say about 1/3 of the time should work so it all turned out good, but I don’t like not checking up on it. I think I need more practice and I’ll get more comfortable and be able to judge different types of foods better! I love how my slow cooker dishes, will now be fast! A neat little contraption to make your olive oil go a longer ways. Facts: is designed with the health-conscious cook in mind. It’s perfect for low fat/high flavor cooking, grilling, sautéing, roasting and basting. Misto is ideal for spraying olive oil on salads, pasta, veggies, breads, pizza, chicken, beef and fish. Keeps in moisture for perfect flavoring and even browning every time it’s used. 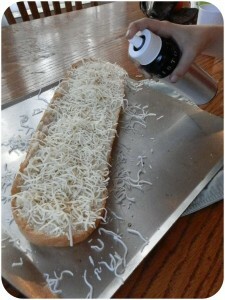 We first used ours when I made some garlic cheese bread. It was fun pumping it up and spraying on to our bread to add a little taste. I love how I will now use less oil because before I would have to pour it out of the bottle where more than enough usually came out. It even works as a plant mister when filled with water! Buy one for your favorite oils, vinegars, lemon or lime juice and more. Refill and reuse again and again! Comes in some bright colors too! I received these items for review I was not compensated in any way and all opinions are my own. This giveaway will end on April 9, 2012 at midnight EST. Winners will be drawn via rafflecopter. Once a winner is drawn I will contact them and they will have 48 hours to reply before I draw a new winner. Giveaway is open to anyone in the US and you must be 18 years of age or older. Giveaway not affiliated with Facebook & I release them of liability. Winner will be posted in the rafflecopter widget. Let’s do another $5 Starbucks Giveaway! I have never used a pressure cooker before but have used a oil spray bottle and find it very convenient and great to use. I have yet to use a pressure cooker but I know a friend of mine who sears by hers. Oops my last comment did not answer your question. I used an oil sprayer a long time ago. My parents has one and it was the neatest thing. I have been looking for one to use at home. I have never used the pressure cooker but my gram loves hers and said I should get one so this would be great to win! I love spray oil! I've never used one, but really want to! Never used one. Sounds like exactly what I need though cuz we are always looking for a quick way to cook chicken! I have an oil sprayer and love it. Would like to try another one with vinegar too. I've never used a pressure cooker before, but my dad has one and he says they are great! i have used the EVOO sprayer for anything & everything but ive never used a pressure cooker b4. I actually got an oil sprayer for Christmas. I haven't started using it yet, but I got it to put olive oil in. I have never used a pressure cooker. My mom had one and her meats came out so tender. I would love to try one! I have never used a Pressure Cooker but here it's the best way to can... I just do water bath. I'd love to try one! I've never used a pressure cooker, but my mom has had one since I was a kid. I haven't used an oil sprayer before. I think the idea is a good one though. You don't have to buy all of those spray bottles with additives. I have not tried a pressure cooker before. I have not used either of them before. I have not used either but would love to! I have not used a pressure cooker but sure would love to. I have used an oil sprayer. I have never used either but my dad had a pressure cooker and the food was always so good. Haven't use either but looking forward to both of them. I haven't used a pressure cooker yet but I remember the meals my mom use to make in hers that were sooo incredible. Used a pressure cooker for many years. It was stolen from a storage unit while I was moving. I was in the hospital and someone broke in. I used it to can for years. Would love to have another one. Thanks for the opportunity to win it. Yes, I have used a pressure cooker stovetop ,also an electric one. I love to pressure cook ,it makes your food taste sooo good. I have never used a pressure cooker but I've been seen many recipes that use it so I would love to win one. My mom always used the pressure cooker. I can still smell her pot roast... Mmmm! I've used a pressure cooker for canning and love it! I have never used either but would love to try it out. I love using a pressure cooker for beans & for cabbage rolls. I have never used an oil sprayer though, looks interesting! i've never used either but would love to try! I have never used a pressure cooker but have always wanted too. I just dont have one. They look awesome though! I have used a sprayer but not a cooker. I haven't used a pressure cooker before, but I'd like to try one! I haven't used an oil sprayer either. I have never used a pressure cooker, but I am interested in pressure cooked fried chicken. Hope to win! I have never used one before but my daughter keeps telling me I need to. I know there are alot of recipes where it calls for them so I skip over the recipes just because I never owned one. I remember when I was a little girl, that my mother used to use a pressure cooker to make roasts for the family. If I win, I know she has a ton of recipes. I'll use it as an opportunity to spend some time with her and learn some of her traditional ways of cooking that would be lost otherwise. I haven't used either one but I love to cook! I have always wanted to use a pressure cooker! 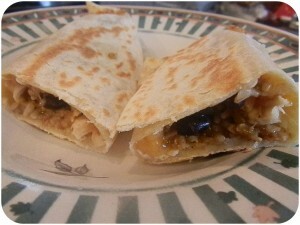 I have heard that they are great time savers and help to make healthy meals. I've never used a preasure cooker (my grandmother used hers a lot). I've always wanted to try one...I think I 'm just nervous that I won't know how long to cook the food. Thank you! I have never used one before they always scared me when i was younger. I've never used either and would love to try them! Although, I'm sure I'd be unsure of myself about knowing when something is done when I can't "see" it either! LOL. I have never used either of these items, but I would like to try. We use a pressure cooker for canning in the late summer. We grow a garden and spend days canning when the season is over. I haven't had a pressure cooker for a few years, but in the past used to can veggies from our garden with my mom. I have used a pressure cooker before, for beans. I'm finally getting a hang of dry bean cooking. They now regularly come out soft and edible. Now I just need to work on the flavoring! The pressure cooker I have is pretty small and basic. This giveaway seems like a really neat, tricked out cooker! I've never used an oil sprayer, though. I've always wanted to try out a oil sprayer, getting tired of the tilt and pour. I have not used either one but would love to try both. I haven't used either, but would love the opportunity. I have an electric pressure cooker ( Wolfgang Puck)....love it. Makes the best pork chops! This would be great to win for a wedding gift I'll be needing! I haven't used a pressure cooker or oil sprayer before, though I've been searching for an oil sprayer. Thanks for the giveaway. When I lived with my parents, I would use their oil sprayer for vegetables and breads. For some reason, I never got my own when I moved out or when we got married. I've used a pressure canner for canning veggies, but it's way too huge to use for regular cooking use. They work really well for cooking though! I have never used these before but I have been wanting a pressure cooker for some time now. My mom had one years ago, but I never used it. I'd love to have one now for canning and such! I make beef stew in a pressure cooker. We have an oil sprayer and really love it! My mother used a pressure cooker but i have not. I have never used either but I would love to try both. Thanks for the great giveaway. I haven't used a pressure cooker or oil sprayer but I want to. Thanks! I have not used either item before. 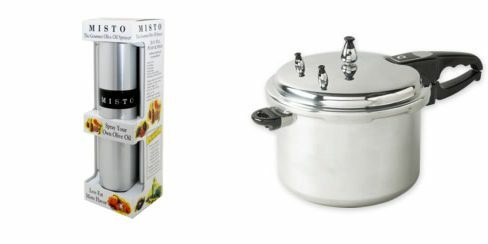 I love the misto but I have never used a pressure cooker before and would love to try one! no. But my mom use to use one and made the best chicken and dumplings in it. My mother used a pressure cooker when I was growing up, but I've never used one. I'm willing to learn with this prize. Thanks for the contest. I have not! This will be new to me! Oh my goodness! I really want this! I love to pressure cook. I have a large one that I use for canning all sorts of food, but a smaller one would be great for soup. I borrowed by mom's for a while and made great soups and ham and beans in it. I have used an oil sprayer a long time ago. It was a Pampered Chef product. We liked being able to choose the type of oil we used to oil our pans. I've never used either, but would love to try both. My sis-in-law used a pressure cooker a good bit and loved it. I use a pressure cooker for corn on the cob, I don't actually know why though, just because that's how my Mom does it I suppose. I haven't used a pressure cooker before but I would love too! I have never used either of these before, but would absolutely love to! I love cooking and these look great. i haven't used a pressure cooker or oil sprayer, but i would love to try them! I personally have never used a pressure cooker but my Mom does all the time and she loves it! thanks! My mother always used a slow cooker but I never learned how. Would love to try and make all her recipes! Never had a pressure cooker, but heard great things about them! 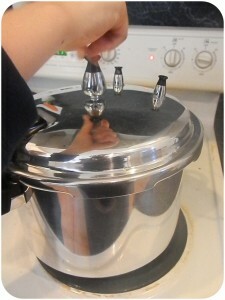 I've used a pressure cooker for canning, but would love to have one and be able to explore other ways to use it! oh my god, I use pressure cooker every single day. I cook rice for my kids in a pressure cooker.... Lentil soup, chicken, lamb with spices, cook vegetables like carrot, squash, sweet potato, beans, fruits like apples, pears, plums etc to make baby food for my infant. I even make dessert using a pressure cooker. Please see the third link in the recipe list given below. I just cant imagine a day without a pressure cooker in our kitchen. I have bought one several years back in Bed Bath & B and I think its time for a new one! Here are some recipes from my blog: http://visitourkitchen.blogspot.com/2011/09/green-papaya-curry.html http://visitourkitchen.blogspot.com/2011/10/sorakaya-bottle-gourd-pulusu.html http://visitourkitchen.blogspot.com/2011/09/junnu.html http://visitourkitchen.blogspot.com/2011/09/chamadumpalu-yamcolocasia-fry.html Thanks for a wonderful giveaway. I am sure the winner will prepare some healthy meals. I'd never used either and would love to try them! I have never used either one but they sure would come in handy! I have never used a pressure cooker before. I would love to cook with one. I've never used a pressure cooker. But my mother in law has and she would love this! No, I haven't but my mom always used a pressure cooker for her fried chicken. I would love to have one of my own! I have used neither, but I would like to. I haven't used a pressure cooker, but I think it would be great if I wanted to try canning. I have never used them before! I use pressure cooker before at my mom's house. Would love to own one for my self. Thanks! I've never used either one...but it definitely intrigues me! We put our microwave away so I'm looking for other tools to use. never used either but it looks interesting. Have never used one before. Would love to share this with my momma! It would be my first time. I think I'd need a recipe book to learn how to do things right with it. I have not used a pressure cooker before but have wanted one forEVER! My grandmother used a pressure cooker but I have not and really want to try one. I haven't used one, but I remember my Mom making the greatest smothered steaks in hers. I honestly have to say i have NEVER used one before but would love the opportunity..
Don't own a pressure cooker. People that use them swear by them. I was always afraid that my pot roast would end up on the ceiling some how. I've never used a pressure cooker. I've always been curious. I've never used a pressure cooker before. I'd love to try one. NEVER! I've always wanted to own a pressure cooker. ive never used a pressure cooker but people highly recommend one! I use a pressure cooker all the time! Makes cooking so much faster. Yes, I used a pressure cooker to make a pot roast. I didn't trust it. It was passed down to me, but I just wasn't sure about the whole thing. I need a new one! I have never used them before, but have been wanting a pressure cooker for ages! My mom always made great food with her pressure cooker and I've always wanted to have one. 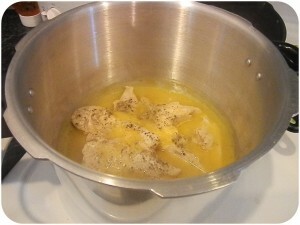 I love fried chicken in the pressure cooker. I would love to win this. As a kid my mom always used a pressure cooker for meals and canning. I have never used a pressure cooker before but we love our oil sprayer! I have a mister, and love. But I've never tried a pressure cooker, and am very interested in the idea. I currently use both of those items. My pressure cooker may be noisy but it cooks so quickly and the taste of the food is absolutely fantastic. My sprayer gives me the oil coverage I need without an overload of oil. Much healthier. My pressure cooker is my favorite appliance in the kitchen. Love it---nothing cooks better! I haven't used them before. I would like to get more into cooking though. I've used an oil sprayer. They're very handy. I've never used a pressure cooker, though. Thanks for the giveaway. I used to use a pressure cooker to make beans. But I don't have one anymore! I have not used either product, but I have been looking into getting a pressure cooker. I love pressure cookers. Used them all the time when I was younger. Cooks so fast and tender. I have never used either....I tried to make my own oil spray, but it didn't work. I used one without the lid, so I used it incorrectly. It belongs to my grandma. Other than that, I have never used one correctly. I have never use a pressure cooker but my mom did and I remember how good the meat tasted. I have never used either a pressure cooker or an oil sprayer before. I have memories of my husbands grandma making fresh greenbeans in a pressure cooker. Boy were they good! I have so many recipes I would absolutely live to try out but they all call for a pressure cooker! Hope I win!!! I have never used wither a pressure cooker or the oil sprayer. I look forward to using both soon. I have never used either. I used to eat dinner at someones house when I was little that used a pressure cooker. Her food turned out delicious. I'd love to win this! I have used an oil sprayer before, while baking and while cooking eggs. I haven't used a pressure cooker before, but that's on the top of my 'try soon' list. Actually, I've used both: I have a kind of makeshift "mister" / sprayer plastic bottle that I use to either spray olive oil or a homemade salad dressing or basting mix out of. As for the Pressure Cooker, my Grandmother had one that was probably already 75 years old before I started using it (helping her in the kitchen.) I don't know what happened to it: I haven't seen it in 25-40 years (!) - but I do remember being VERY scared of it 0f the steam! I think she/we mostly used to to cook veggies that took a long time to cook, like root vegetable (most especially RUTABAGA - which I would like so much to make for my Honey/Hubby as it is one of his favorites! Thanks for the great giveaway! Hello, how are you? Thank you for this opportunity. Yes I have used pressure cookers before to tenderize beef roasts. I've not used either of them before. I have used a pressure cooker with my grandmother. I never have used or owned one before but it sounds amazing! I've used an oil sprayer before and loved it. I'm wary of trying a pressure cooker due to years of hearing horror stories. However, I'm sure they are safer now and would like to try. I haven't used a pressure cooker before but would like to. Never used a pressure cooker, curious to know if i would like it.